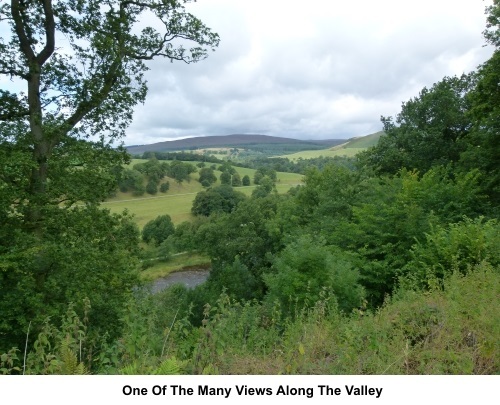 OS Explorer 297 – Lower Wharfedale & Washburn Valley or OL2 Yorkshire Dales - Southern & Western. 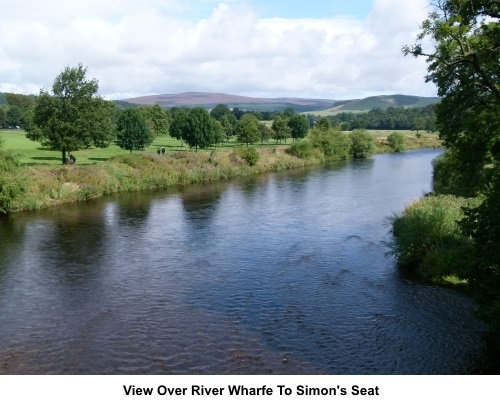 Introduction: This walk takes you through part of the Duke of Devonshire’s Bolton Abbey estate, following the course of the River Wharfe. Some is on concessionary footpaths. The area is a tourist honey-spot so unless you go out of season, you are likely to encounter plenty of company. Having said that, it is a very pleasant woodland walk, through one of the largest areas of acidic oak woodland in the Yorkshire Dales. The walk travels some distance from the main car park areas and as most punters are too lazy to walk far, much of the walk is still peaceful. Some of this walk also follows part of the Dalesway. One positive aspect of the walk being through a tourist spot is that, in the main, the paths are well maintained and wide. Although this makes the walking easy, it still needs to be treated with a little respect. The outward leg has some very steep drops down towards the river, which could cause you significant injuries, if you tumbled. The walk takes you as far as Barden Bridge, built in 1659. It is Grade II listed and a Scheduled Ancient Monument. From the car park next to it, my Barden Bridge to Simons Seat walk starts. 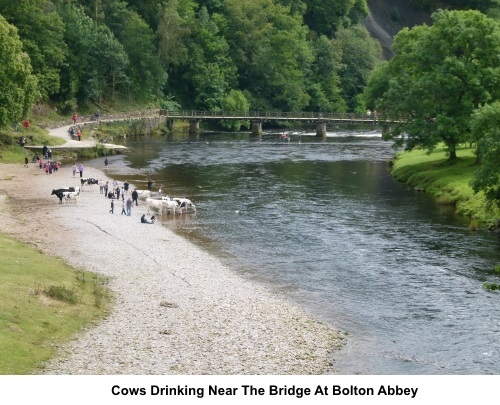 The return leg takes you past the famous and dramatic Strid. 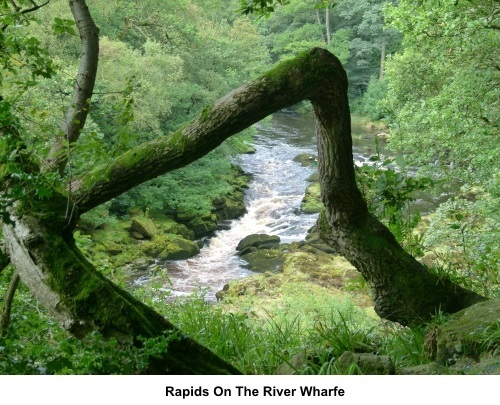 Here, the River Wharfe funnels into a narrow channel. When you look at the width of the upstream section and realise how the water is squeezed, it is obvious that the channel must be extremely deep. The currents are fierce and legendary. Take great care. 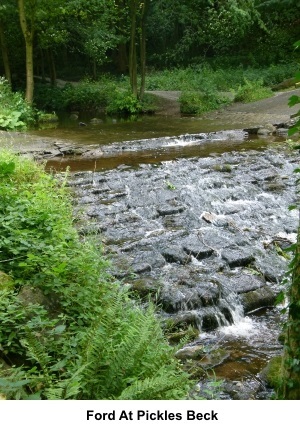 Rocks close to The Strid can be very slippery. If you fall in, you will not see the light of day until the divers fish out your corpse! Harsh but true. 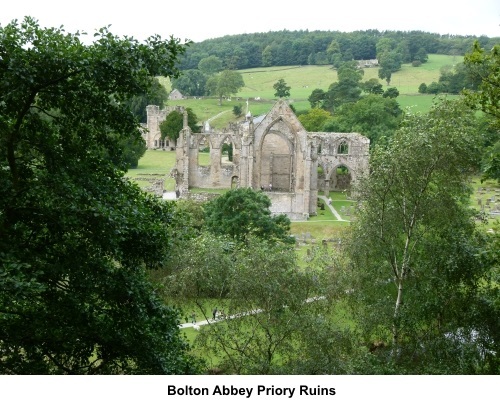 The Bolton Abbey walk gives you an opportunity to visit the ruined Priory. 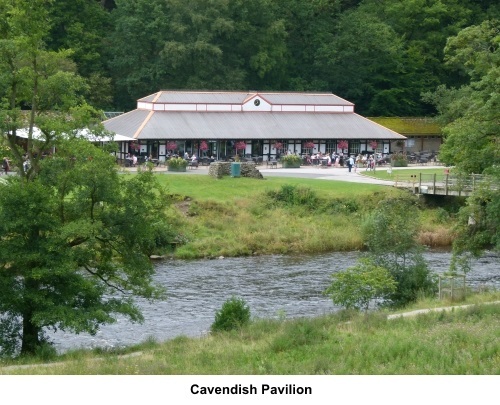 There are various refreshment opportunities en route, the most convenient being the well known Cavendish Pavilion. There is a scattering of benches along the route for picnic stops and there is also a large shelter on the outward journey, should the weather be inclement – see sketch map for approximate position. a) From the roundabout, take the B6160 south towards Addingham. There is a rough lay-by a few hundred yards along the road, on the left. 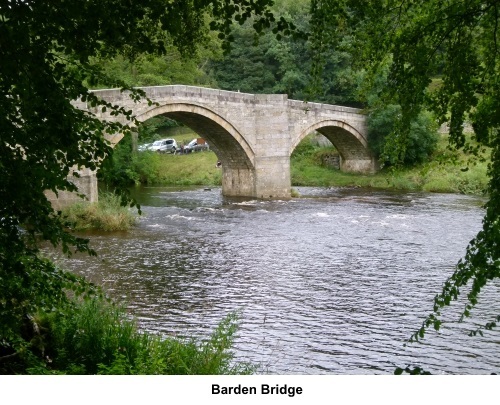 b) As this is a circular walk, you could start from the car park at Barden Bridge. I have provided a GPS route but this will be of limited use due to the trees. Start: From the small car park (SE071530), continue along the lane away from the B6160, through the double gates and cross the river. Turn left just before the farm, following the fingerpost for “Priory and Footbridge”. You barely need any further directions. 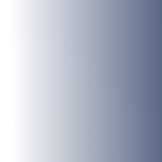 It is a case of following the clear footpath by, then above the river, at some height in places. 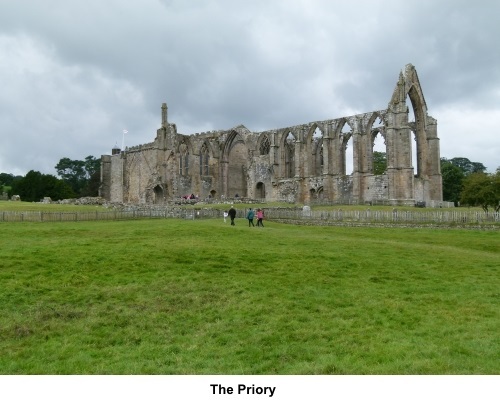 You pass above the Priory ruins with good views. Eventually, at SE 081550, the path meets a lane at a ford over which flows Pickles Beck. If necessary, there is a footbridge to maintain dry feet. Once over this, take the path across the road, fingerposted for Posforth Bridge (this is not the wooden bridge you can see leading to the Cavendish Pavilion, but a stone one you see further on). At the river, do not cross it but turn right to follow the clear path. You reach a junction where the right hand path is signposted for Simon’s Seat via the Valley of Desolation. Ignore this and continue to follow the path by the river, climbing the stone steps. Pass Posforth Bridge, a stone bridge carrying the road over Sheepshaw Beck (SE 074559). 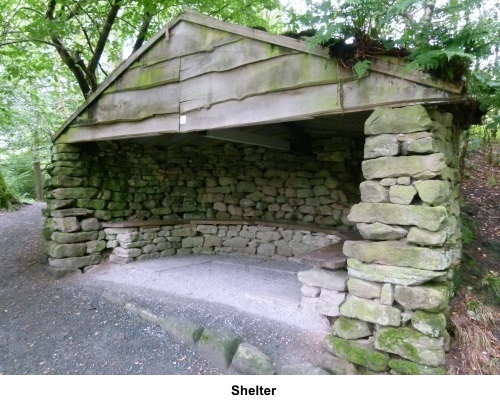 You pass high above The Strid and soon come to a stone shelter with plenty of seating. 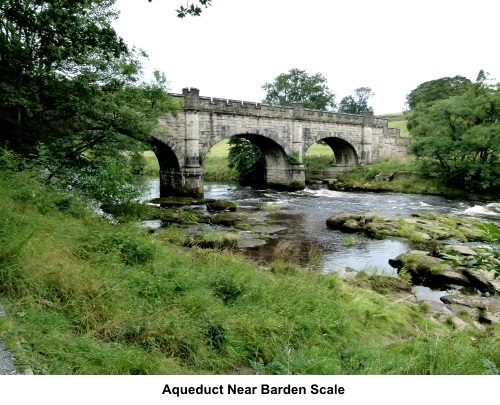 The next landmark is the aqueduct. A path crosses this should you wish to shorten the walk (by about a mile). Otherwise continue along the river to Barden Bridge (SE 052574). On the way you will catch glances of the Barden Tower ruin across the river. “Barden” means valley of the wild boar and this ruin was a hunting lodge, built in the 16th century. Cross Barden Bridge and go through the gate on the left to follow the well manicured path. 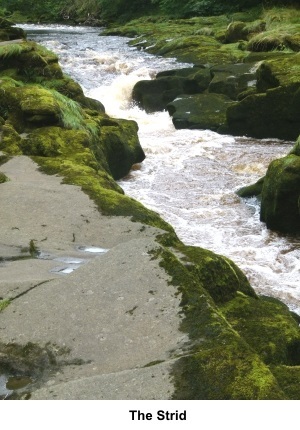 You come to The Strid and are likely to hear its roar before you see it. Please take great care here. Come to a fork in the path where the left fork goes to the Lud Stream Islands. Keep right. 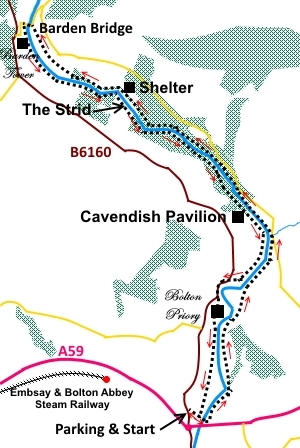 Pass the Cavendish Pavilion and follow the main path by the river until it climbs to join the road at the Cavendish Memorial, built in honour of Lord Frederick Charles Cavendish, son of the 7th Duke of Devonshire. Turn left to follow the path by the road for a short distance before turning left through a gate, to walk down to the Priory. Descend to the river once more to follow it past the stepping stones and bridge. 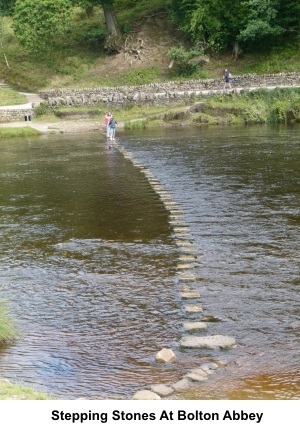 There is no need to cross the river but please be careful if attracted to trying out the stepping stones. There have been incidents here with people being caught out by either the depth of water or sudden torrents. 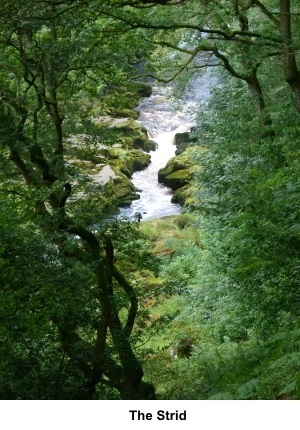 The path follows the river back to the start point.